Cypress, CA (December 15, 2018)-A better view helped Kookie Gal win the first stakes of her career in the $100,000 Soviet Problem Stakes for California-bred 2-year-old fillies at Los Alamitos on Saturday. Racing without blinkers for the first time, Kookie Gal rallied from fourth in a field of six to win the Soviet Problem Stakes by four lengths. Ridden by Flavien Prat, Kookie Gal ($4) was timed in 1:37.18. Prat said the absence of blinkers “helped a lot” for Kookie Gal, who was sent off favored. “She got a little keen, but settled on the backstretch,” he said. Hotitude, who broke from the rail, set an early pace of 24.07 seconds for the opening quarter-mile, disputing the lead with Creative Instinct, who led through a half-mile in 48.45. Kookie Gal rallied three wide to pass those two runners and take the lead with a furlong remaining. “She gave me a good kick in the lane,” Prat said. Hotitude edged Creative Instinct by a half-length for second. All Tea All Shade finished fourth, followed by Gotta be Lucky and Time for Suzzie. Kookie Gal, who is trained by Peter Miller, is the first stakes winner for Boisterous, who is by Distorted Humor. Kookie Gal is owned by Gary Barber and Wachtel Stable, who bred the filly. Kookie Gal has won 2 of 3 starts and earned $89,000. She won her debut in a maiden special weight race for California-breds at Santa Anita on Oct. 18 and was fifth in her stakes debut in the Grade 3 Jimmy Durante Stakes at a mile on turf at Del Mar on Nov. 24. Cypress, CA (December 7, 2018)-Ministers Wild Cat’s two-year-old filly scored an impressive four length win in a open maiden claiming event at the Los Alamitos Race Course. With her stalking and four wide trip Tiz a Master won clear in just her second start. She has now earned $11,520. 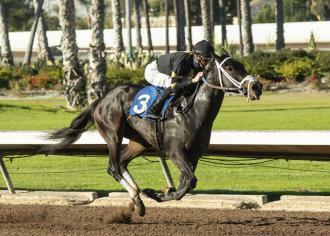 Bred in California by Say Jay Racing, LLC she is out of Bea’s Cee, by Cee’s Tizzy and was trained by William Morey. Ministers Wild Cat is currently the ninth ranked California sire with over $2 million in 2018 earnings. Hobbs, NM (November 6, 2018)-Life of Illusion a filly owned by Tommy Town Thoroughbreds LLC garnered her fourth lifetime win and pushed her earnings over $135,000 with a two length Zia Park allowance win. The filly is a four-year-old and has finished eight times in the money from her eleven starts. She is by Harlan’s Holiday and out of Atlantic Park (Awesome Again). Arcadia, CA (October 27, 2018)-Mad Mike crushed a field of eight Cal-bred juveniles by four plus lengths en route to picking up his $18,000. Mad Mike finished off the board in his only other start. He is a son of Ministers Wild Cat out of Open Mic, by Unbridled’s Song and was bred by his owners Tommy Town Thoroughbreds, LLC. Ministers Wild Cat will stand in 2019 for a fee of $4,000 live foal; he is currently sitting at number seven on the 2018 California General Sire list with $1.8 million in earnings. Arcadia, CA (October 27, 2018)-Old Indian Trick the three-year-old son of Ministers Wild Cat got his second win of 2018 by taking a Santa Anita starter allowance race by half a length. The lifetime record of Old Indian Trick is now at two wins, four thirds from eight starts all in 2018 total earnings now $59,460. Owned by Paymaster Racing LLC and Sinister Racing Stable, he was bred in California by Tommy Town Thoroughbreds, LLC and is out of the stakes winning and multiple graded stakes placed Ms Vanenzza (Successful Appeal) who earned $244,365 in her career. Arcadia, CA (October 18, 2018)-Kookie Gal is another winner sired by Boisterous; increasing his commanding lead as the top freshman sire in the Golden State. Kookie Gal is the third winner for her sire and the second maiden special winner in Southern California. The Wachtel Stable & Gary Barber homebred daughter of Kukaluka, by Comic Strip went off as the favorite in the field of nine. She earned $30,000 for the win getting the turf mile in 1:35.97. Arcadia, CA (September 30, 2018)-It’sjustanillusion a Tommy Town Thoroughbreds, LLC homebred juvenile filly debuted with impressive style by taking a maiden special at Santa Ania by two and three quarters lengths. Bred in Kentucky the filly is by Uncle Mo out of Silent Fusaichi (Fusaichi Pegasus) and earned $30,000 for the win in her debut. Cypress, CA (September 15, 2018)-Dannie Joe a three-year-old daughter of Old Topper graduated by two lenghts in a Los Alamitos $50,000 maiden claimer. The filly was bred by owner Pete Gallegos and has earned $12,945 in her two lifetime starts. She is out of the Ministers Wild Cat broodmare Joe Ja.